Preparations are being made to take the 2020 Census. This process is not just a fun game to spell out demographic changes and interesting tidbits about us as Americans. It is a very important mandate dictated by the Constitution. The number of people counted determines how many seats each state has in Congress. Thus, it is taken every 10-years. The Country has been changing, demographically, over the last decade, as it always has over the course of history. The states of California, Texas and Florida continue to grow exponentially. All Americans, not just older ones, seek the sun. They like a sunny, warm climate. That is why our neighboring state of Florida is and has been for decades America’s growth state. Last week I visited with you about our 1940’s Congressional Delegation. At that time we had nine seats. We lost one after the 1960’s census. We lost another after 1980. We are projected to lose another one after this upcoming Census of 2020. We now have seven seats. It is predicted that we will only have six after next year. We most certainly will lose one to California if they are allowed to count illegal immigrants. The State Legislature is constitutionally designated as the drawer of lines of congressional districts for each respective state. Currently, we have six Republican seats and one Democratic seat. If indeed we drop from seven to six Congressional districts, how will it shake out. The census will reveal that Huntsville and North Alabama have been our growth spots. Alabama’s population continues to move toward the northern tier of the state. Two out of every three Alabamians live in Birmingham, Hoover, and Tuscaloosa north. The Black Belt continues to lose population. The census will also reveal quite a disparity of financial prosperity. It will show that the same Black Belt counties are some of the poorest areas of the country and conversely Huntsville will be one of the most prosperous. So who are the winners and losers under Congressional redistricting? You start with one premise. You have to have one majority minority African American district. The federal courts have mandated this edict. Therefore, Congresswoman Terri Sewell’s district is sacred. It now is very large, geographically. It will become even larger. The district will take in most of the African American population in Birmingham, Tuscaloosa and Montgomery, and the entire Black Belt stretching from south of Birmingham and Tuscaloosa all the way to Mobile. It will be a big geographic district and be numbered district six rather than seven. This leaves us with five Republican districts and six incumbent Republicans. Therefore, who gets the short end of the stick. A cursory look says the odd person out is Martha Roby in the second district. However, our current delegates have already come up with a plan to save everybody. Mo Brooks, the Congressman from Huntsville, will choose to move up or out in 2022. 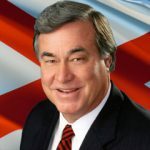 He is assuming that Senator Richard Shelby retires at age 88. Therefore, Brooks will see his fast-growing Tennessee Valley district divided and delved out to a plan that grows the districts north, which complies with the growth pattern. Our senior and most seniority laden Congressman, Robert Aderholt, will opt to stay in Congress rather than risk a run for the Senate. This is a very wise and prudent move for him and the state. He has over 24-years in seniority and is in line to be Chairman of the House Appropriations Committee. He will move north and pick up part of the Huntsville area and he will cut Gadsden loose. Mike Rogers will move north and pick up Gadsden and all of northeast Alabama, which is a more natural fit for him with his native Anniston area. Rogers’ move north will allow him to abandon Auburn-Opelika, which in turn allows Roby’s district to exist primarily like it is with the population centers of East Montgomery, Elmore, Autauga, and the Wiregrass and Dothan and that district will add Auburn-Opelika. The current 6th District of Jefferson-Shelby represented by Gary Palmer will remain essentially the same. Its upscale suburbs will make it one of the most Republican in the nation. The last district seat of Mobile-Baldwin will remain intact and will still be District 1. However, the tremendous growth of Baldwin will require that the district only contain Mobile and Baldwin. The cadre of rural counties north of Mobile that are currently in the District will have to be cut loose to probably go to the Black Belt district. The current 1st District Congressman, Bradley Bryne, is running for the U.S. Senate in 2020. However, his replacement will be a conservative Republican. Always enjoy learning from you the workings of AL.